Make a meaningful contribution to the continued success of the Michigan Wildlife Conservancy by volunteering your time to be a Friend of the Bengel Wildlife Center. Friends perform a variety of tasks and roles throughout the year. Some work on on-going tasks, and others lend a hand for special wildlife conservation projects. Individuals, families, businesses, and adult and youth community service groups can take part. Volunteering for the Michigan Wildlife Conservancy is a great way to meet new people, gain new skills, and demonstrate your commitment to wildlife and the habitat they depend on to survive and thrive. 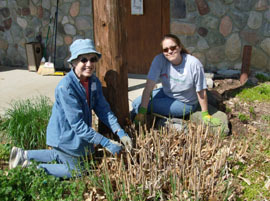 ADOPT A GARDEN - Join other Friends in helping maintain a variety of gardens, demonstration areas and nature paths on the grounds of the MWC’s Bengel Wildlife Center in Bath. You should have some knowledge and experience in gardening, but instruction and guidance will be provided. COMMUNITY OUTREACH - Help make others aware of the Michigan Wildlife Conservancy by assisting with a variety of educational presentations made at locations across the state. Many workshops are presented on nights and/or weekends and training is provided by MWC staff. GENERAL OFFICE / CLERICAL AIDE - Often we need help with office work including filing, copying, stapling, assembling materials, and mass mailings. Office experience is helpful, but not necessary. HIGH SCHOOL COMMUNITY SERVICE - High school students who need to fulfill their National Honor Society, class required or Merit Scholarship requirements can do so by working in a variety of capacities at the MWC. Teachers may also organize special class community service projects that can be completed at the Center. SPECIAL EVENTS - If you’d like to work behind-the-scenes assisting MWC staff conduct a variety of special events held throughout the year, then this is the job for you! Dates, times, and tasks will vary with each event, but can include planning, set-up, greeting guests, assisting visitors, giving tours, and tear-down. No prior experience needed, though enthusiasm and an interest in working with people are real assets. WORK BEES - From time to time, organized Work Bees are conducted at the Bengel Wildlife Center to ready the 259-acre facility for visitors and guests. 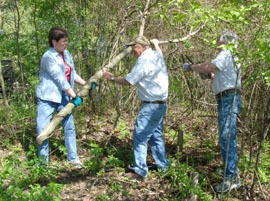 Tasks range from brush and trail clearing, laying wood chips on paths, pruning, raking, planting and removing invasive species. This is an excellent opportunity for a business, community or high school group to organize and complete a meaningful community service project. Work Bees are generally held on a Saturday, and a complimentary picnic lunch is provided. For more information about volunteer opportunities with the Michigan Wildlife Conservancy and to learn how you can lend a hand, contact John Ropp at 517.641.7677 or email: jropp@miwildlife.org.